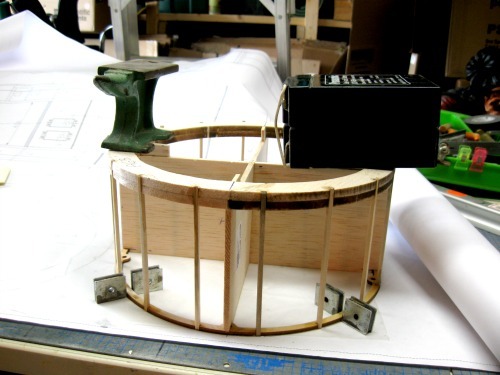 Build an RC cowl, that looks as good as a fiberglass unit and can be split for maximum access and retained by super strong rare earth magnets. 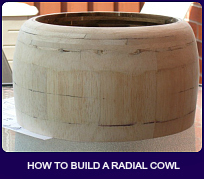 If you need a radial RC cowl and a fiberglass version is not available you could mold your own. This is a long process for a one-off and not all of us has the required knowledge and experience. The method explained here is quick and results in a light weight and strong cowl. The outside dimensions and shape of your cowl need to be determined. Some cowls are a straight cylinder, others have a curved outside diameter and some have blisters to accommodate valve covers etc. 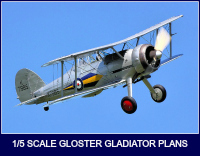 The example we are using here is for a 1/5 scale Gloster Gladiator. You will notice that for this RC cowl I have shown an optional split plate. As my model will be electric powered I like the idea of splitting the cowl to give access to the lipo batteries for changing purposes. I will give more details later of this option. Your design can be less complicated than mine and can just be a free hand sketch. If you have problems with designing contact us and I will try and help you. 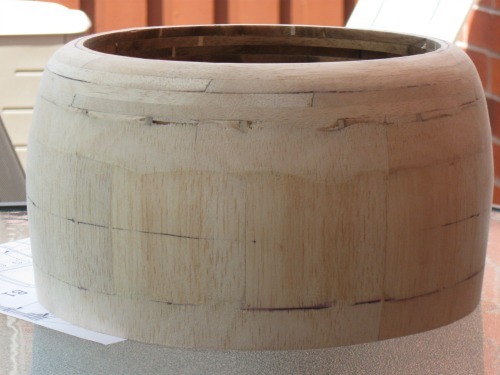 The nose ring parts (A6, A7 and A8) are laminations of 1/4" thick balsa. These parts were laser cut and if conventional cutting is used they could be made from 1/2" thick stock. 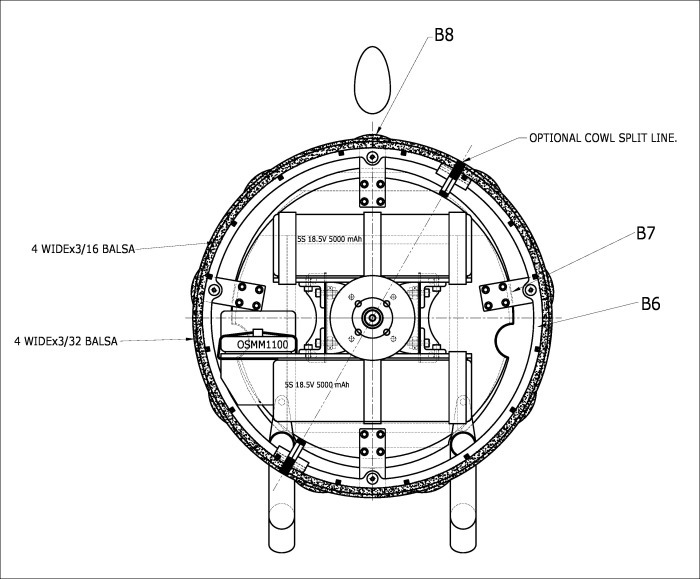 This drawing shows the front view of the Gladiator RC cowl. Note that because I opted for the split cowl the two B7 support pieces were moved to the fixed portion of the cowl. 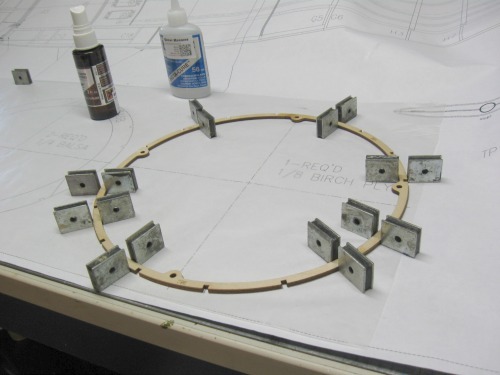 The ply cowl ring is assembled first, from 3 segments, over the plans. Notice the use of magnets to hold parts together. I then used CA on the joints and a squirt of accelerator. I have been using magnets for years and would not consider going back to the old way. It is simple and quick to fashion special fixtures for a lot of things. 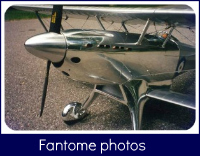 Great Planes used to sell a system but alas it is no longer available. I bought the steel sheet from the local Lowes store. It is 4ft. x 2 ft x 0.032" thick and has some kind of plating, that prevents corrosion. 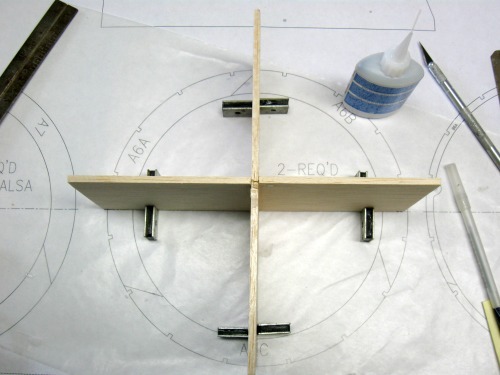 Assemble the front, balsa rings, then make a cross as shown here. I used 3/16" thick balsa. This cross is used as a temporary internal brace that is removed when the construction is complete. Use whichever thickness is appropriate for the size of RC cowl you are making. 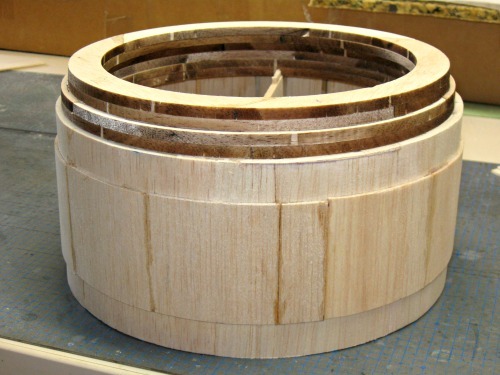 This photo shows the stringers glued in position (1/8" square spruce) and the top formers. Note that the cross is glued to top and bottom formers. The old field box battery and the miniature anvil are used to weigh everything down. Check for squareness to the work surface. The basic sheeting has been applied . I used 4" wide x 3/16" balsa. ( Note the grain direction). A squirt of Windex on the outside surface made it easier to form around. 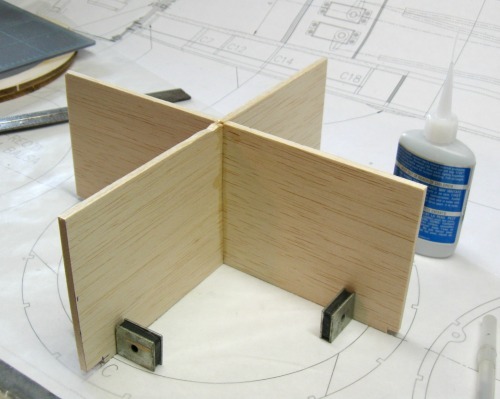 Note that the cross is tack glued into position and as well as supporting the structure it makes a useful hand hold! 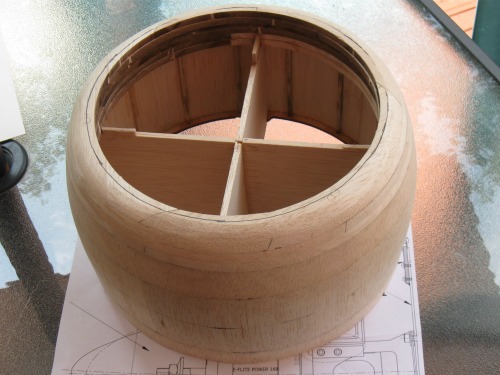 Here we can see the outer layer of 3/32" thick balsa has been applied and the upper rings have been glued in position. 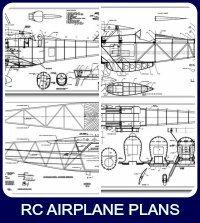 This completes the basic structure of this RC cowl. 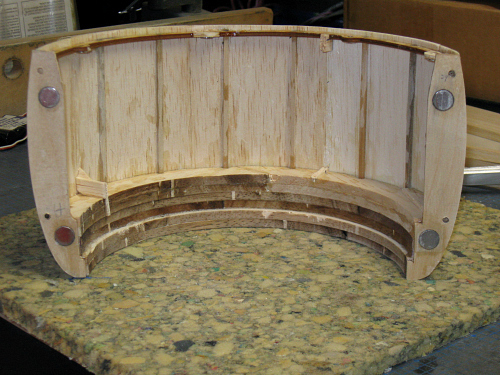 All that remains is a lot of sanding to create the curved outer surface. Here it is. I did make a profile template to help in forming the double ellipse shape on the outside surface. Now the internal cross piece can be removed. The 9 blisters need to be added and of course the cowl has to be finished. I will be covering it with 1/2 oz. fiberglass cloth and resin and then painting it to suit the colour scheme of the Gladiator. 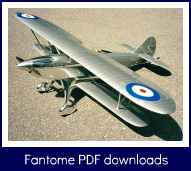 Now I will have no problem in building a model that does not have a fiberglass cowl available. 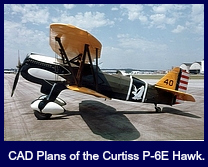 This process could also be used to make oval shaped cowls like the P-47 Thunderbolt. It is simple and quick and light! 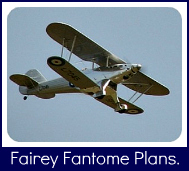 The RC cowl shown here is for a 1/5 scale Gloster Gladiator that is electric powered. 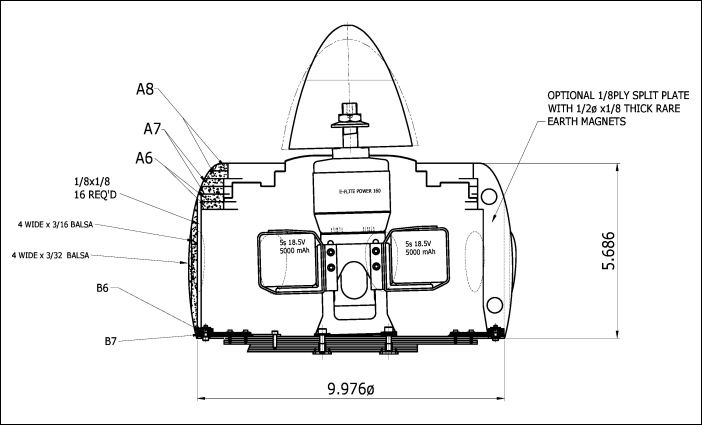 I want to mount the large lipo batteries (2x 5S) inside the cowl to help balance the model. These will obviously need to be replaced frequently so a quick access system was called for. A 180 degree split would give ample room to remove the batteries and I was intrigued by the possibility of using rare earth magnets to retain the cowl halves. If the magnet idea worked there would be no need to use small screws that always seem to get lost in the tall grass! After some internet research, it looked as if a 1/2" diameter x 1/8" neodymium magnet would work. These little suckers can give a pull of 6 to 9 lbs each! If I used 4 such magnets then the total force holding the cowl together would be 24 to 36 lbs. It took me a few days to decide whether to go ahead with the idea. The thought of razor sawing into my new cowl was challenging! However I went ahead and am now really glad I did. 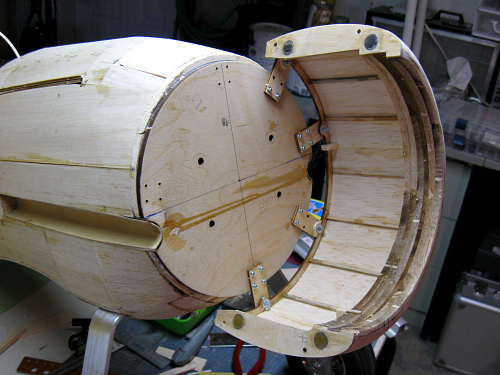 This photo shows the removable part of the RC cowl. 1/8" thick ply plates have been added and the magnets have been glued in position. Use epoxy for this and the magnets should stay in position for ever. 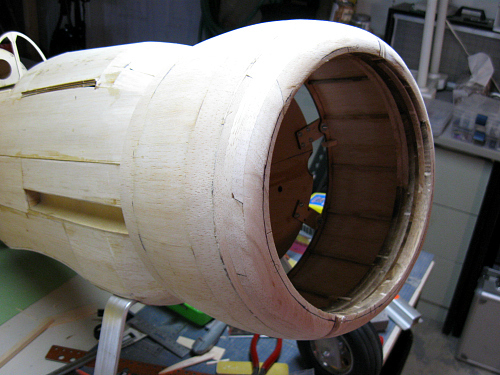 A scrap of balsa was used on the back side of the 1/2" diameter holes. Note that the holes were drilled through the stack of 4 ply plates, on a drill press, to ensure alignment. A nice feature of the magnets is that they self-center and alignment pins were not required to ensure cowl halves lined up perfectly. You will have to be careful with the magnets before installation. They are very strong and can cause finger pinching! When in a stack they are very difficult to part and much sputtering and maybe swearing can be heard when trying to separate! Before installing and gluing in position, check the polarity of the magnets. We want to hold the cowl together-not make it fly apart! Here we can see the fixed half of the cowl. I have moved two of the cowl retaining plates to the fixed side , for rigidity and stability. 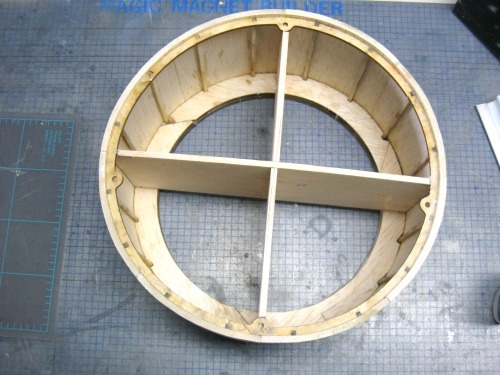 For future projects I will build in the ply magnet holding plates and thus avoid the need to cut the cowl after completion. 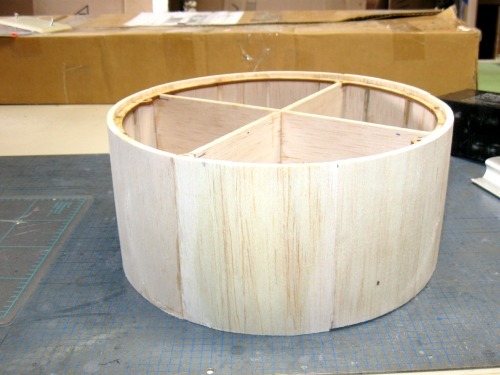 Those ply plates can also act as hard sanding guides when forming the outside shape of the cowl. I purchased the magnets from a local industrial supply house. You could find a similar place by internet searching for "Rare earth magnets"